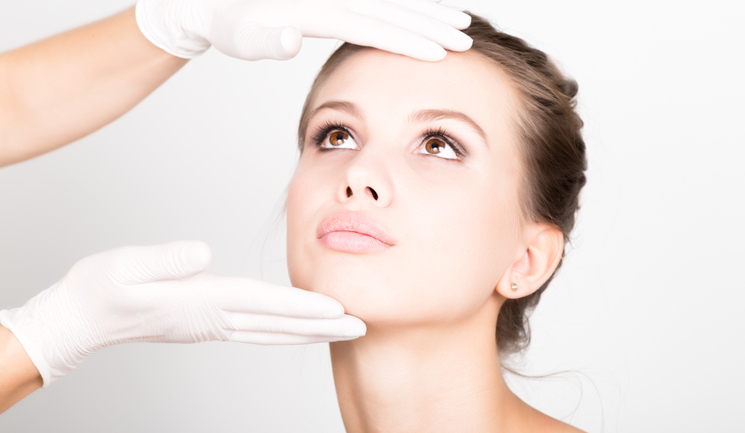 As aesthetic practitioners, safety should be our number one priority. In the best interests of our patients, we evolve and develop new skills and approaches to consultation and treatment. Regardless of experience and training, one of the toughest challenges of consultation is merging patient ‘wants’ with patient ‘needs’ or marrying the opinions of our patients with our own. Greek derivations of the third century BC phrase says, ‘beauty is in the eye of the beholder’,1 however, in more recent times, it seems that beauty is now ‘in the eye of Instagram’. With the rise in social media and photo editing software such as Photoshop and Instagram filters, we are seeing an increase in younger patients hoping to replicate the looks they can achieve through photo editing. My method, the 3D face-refresh, hopes to marry ‘patient want’ with ‘patient need’. For example, a patient may want nasolabial fillers, but from an aesthetic perspective, they may benefit more from improving mid-face volume or subtle cheek enhancement rather than a direct injection into the fold. It is important to note that young patients do not necessarily ‘need’ treatments, but this approach, which uses dermal fillers, can be a safe and methodical treatment for the younger age category (21-30) who want to tweak, touch up and correct minor imperfections that are commonly addressed using Photoshop and filters. I have found that young patients are often looking to correct prominent nasolabial grooves, tear trough hollowness, flat cheeks and chin contour and proportion imbalance. This procedure involves small injections of a volumising dermal filler using the three beautification triangles to create lift, volumisation and enhancement of the upper, mid and lower face. The basis of a holistic approach to facial aesthetics has been around for a while now, as more practitioners move away from just fixing nasolabial folds and marrionette lines to addressing actual ageing factors like mid-face volume loss. 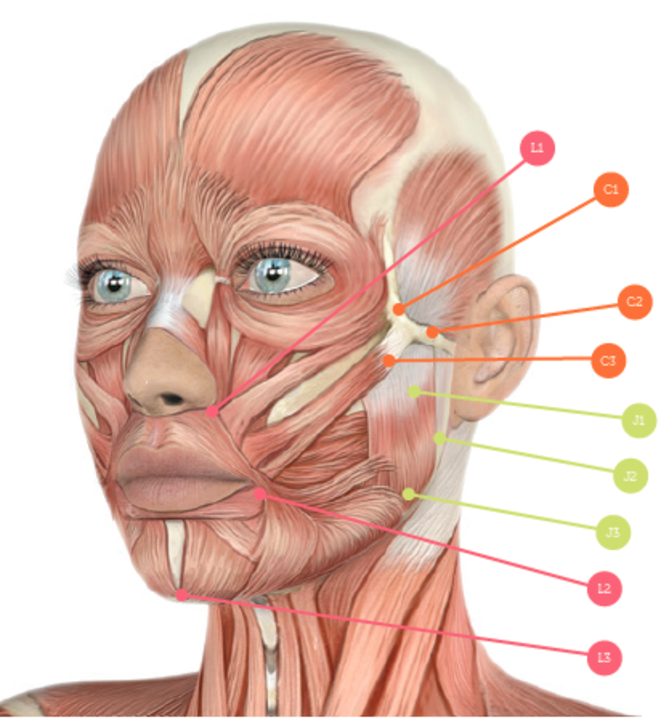 The face, independent of age, is divided into the upper, mid and lower face. Using small quantities of a volumising hyaluronic acid-based dermal filler, improvements can be made in these regions. You should ensure you have adequate experience and training to undertake advanced dermal filler procedures such as those described below. This consists of the three points shown on Figure 2 (C1-C3). Small periosteal bolus injections should be inserted, ensuring that you aspirate your syringe before injection.2 It is important to note that the amount of product is dependent on the individual. This will provide a subtle cheek lift and volume enhancement as well as improve lateral cheek and zygoma definition. It also softens the lateral epicanthal folds and lateral tear trough. When injecting, I personally use cannula due to the sensitively of the area and surrounding nerves/arteries such as the infraorbital nerve and angular vessels. I also find that the use of cannula can reduce the risk of bruising. Three points on Figure 2 (J1-J3) are accessed with a 25G cannula using an anterograde linear approach. This will aim to provide a tightening effect and muscle modulation across the superior and middle insertion points of outer masseteric muscle in the subcutaneous plane. A needle can be used instead, but cannula is my preference as I find that it allows the product to spread evenly within the tissues, which can create more effective augmentation over a larger surface area. This triangle should tighten the jawline, improve the appearance of the jowls and treat nasolabial and marionette lines, providing the patient lower face rejuvenation. The marionette lines can also be addressed by combining the lower face triangle described below, but in my experience younger patients benefit from having the jawline lift and contour triangle first. Three points are injected as shown in Figure 2 (L1-L3) using bolus injections – I prefer to use a syringe. The practitioner should perform a deep nasolabial periosteal injection into the piriform fossa. Figure 2: Injection points for each triangle of beautification. 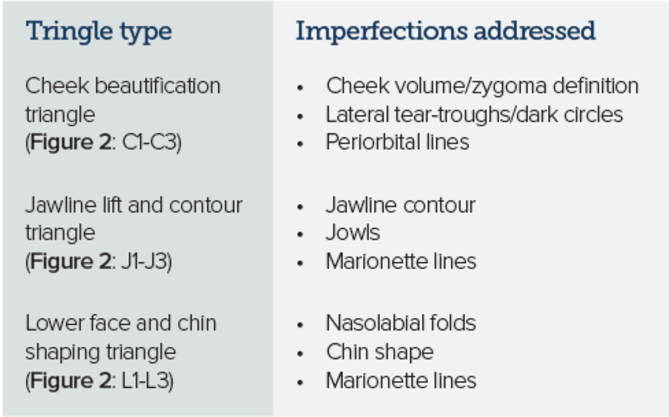 C1-C3 are indicated for the cheek, J1-J3 are indicated for the jawline and L1-L3 are indicated for shaping of the lower face and chin. Firstly, a thorough consultation should be carried out to discuss prior medical issues and history. Contraindications are essentially the same as those used for any dermal filler treatment and should include relevant psychology such as body dysmorphic disorder. I have found that unrealistic expectations are especially common in this age group. It is a good idea to divide the treatments into a number of sessions and to undergo a ‘less is more’ approach. It is recommended to take before and after photos and gain appropriate consent during each session. Emphasis should be placed on natural-looking results and enhancement for a more refreshed appearance, as this treatment method does not result in drastic or unnatural looking changes in contour or shape. 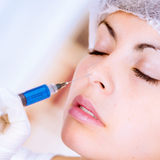 To avoid overcorrection, you can make smaller volume injections at a time. Ensure patients know of the appropriate aftercare and are mindful of downtime. Some of my aftercare advice is to avoid touching or rubbing the area, keeping the area clean and dry, not to do any excessive exercise or use saunas or steam rooms for 48 hours and not to have facials for two weeks. I also advise them to go back to their usual skincare regime the next day. 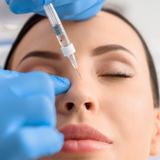 Even though there are relatively few points of injection, there is always risk of bruising and dermal filler-related complications, which should be outlined to the patient before the treatment.3,4 After the consent process is complete, skin preparation should be conducted. Use an anti-bacterial based wipe and topical local anaesthetic to ready the patient for the procedure with emphasis on aseptic technique. Please also note that regardless of set and safe points of injection, every person is different and you should be aware that our patients’ physiology varies so some points of injection and beautification triangles may not be applicable. To spot these, you need good knowledge of the anatomy and an aesthetic eye, which comes with experience. Product quantity is variable, however, most often, between 1-2ml of a volumising hyaluronic acid is required for the whole procedure. Complications should be divided into immediate, early and late. 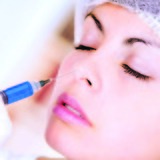 Immediate complications, as with any dermal filler injection, include bleeding, bruising, pain and discomfort, all of which should be minimised with safe technique and application of topical anaesthetic. For your young patients who present in clinic, the 3D face-refresh approach can be a good option for natural improvements for contouring. If the practitioner is aware of facial anatomy and uses small quantities of volumising dermal filler in safe injection zones, downtime and complication risk is minimal. The practitioner should provide a detailed summary of the treatment plan and ensure thorough consultation to make sure patient expectations are addressed prior to the treatment. The practitioner should use a less is more approach and consider doing the treatments over multiple sessions, with a follow-up after two weeks and be aware of the contraindications and possible side effects. Braz A, Humphrey S, Weinkle S, et al. 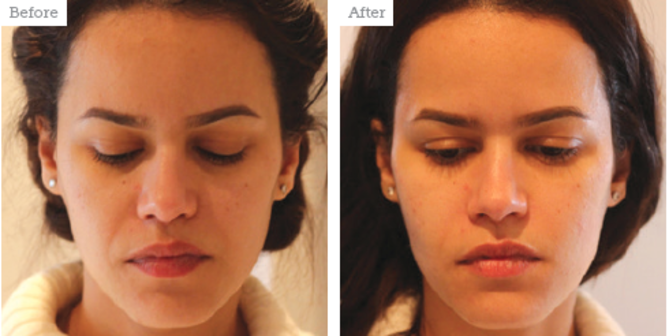 ‘Lower Face: Clinical Anatomy and Regional Approaches with Injectable Filler’, Plast Reconstr Surg, 2015. DeLorenzi C, ‘Complications of injectable fillers, part 2: vascular complications’, Aesthet Surg J, 2014; 34:584. Jaishree Sharad, ‘Dermal Fillers for the Treatment of Tear Trough Deformity: A Review of Anatomy, Treatment Techniques, and their Outcomes’, J Cutan Aesthet Surg, 2012, 5(4) pp.229–238.